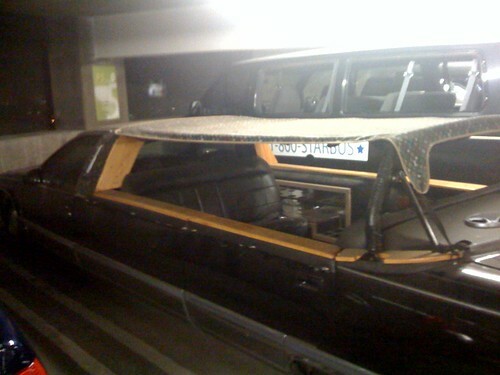 how farking awesome…some limo chopped and a soft top outta LV made. Total fair weather cruiser. 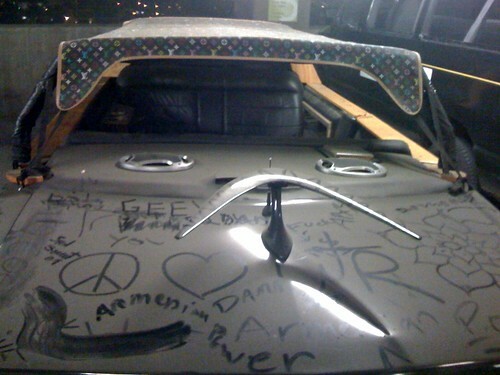 I’d guess its ability to cruise is going to be very slow with the loss of rigidity when the roof was lopped off. Its the oddities out there that just make life around here so interesting. The two inches of dust on it was pretty slick too. Well, first… first,… nope, Sean is right. I don’t even know where to begin. Some words flashing before me: excess, class, class boundaries, ingenuity, leather, weather, wood, Home Depot, freedom, personal expression, safety, hygiene, decoration, aesthetics, seat belts, black, Cadillac, ladder frame, the beach, drifting in an icy parking lot, the end, Monty Python, crunchy dog. I’ve seen it there too! Wacky! dp are those good qualities or bad? Its simple freedom of expression for the dude, nothing wrong with that. frazgo, you’re right. It’s all good. I like how it challenges preconceptions. You know, when the auto makers were flush with cash a few years ago, they nearly all had design studios in the Southland. Yes, yes, the designers talked about the special light here, but I think it’s also because this place had nearly all the different lifestyle groups living here, something that you probably couldn’t get anywhere else in the country. The car makers could study how different groups used their vehicles and didn’t want to be caught with their pants down when it came to the latest ideas. Like in the early eighties, when a few Detroit execs came here for a car show, and their jaws dropped when they saw all the efficient Honda Accords on the freeway. Next PostNext Bigots have rights too.